Certain permits & licenses, by ordinance, are not fulfilled through specific departments, and are instead the direct responsibility of the Office of the Mayor. Sale of second-hand goods or crafts. Permits are not transferable and may be revoked for misconduct, false representation or fraud. Permits do not endorse or recommend the product being sold by the solicitor. They are only permission to solicit within the City of Niles, Ohio. Permission to solicit at shopping malls, stores, or shopping plaza must be obtained from the owners, since these areas are private property. All other permits that might be needed shall be obtained by applicant prior to the start of the solicitation. 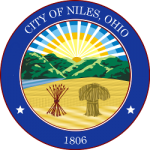 In the City of Niles there will be no door to door solicitation after dusk if by appointment. Permits do not constitute an endorsement by the City of Niles, or by any of its departments, officers or employees, of the purpose of persons conducting this solicitation; nor does it authorize the conduct of any event or activity prohibited by law. Upon approval, a permit is issued with a unique number, and is non-transferable. Block party permits are valid only on the specified date, void afterwards, and should be returned once they are expired. Miscellaneous licenses to conduct business or other activities within the City of Niles are handled on a case-by-case as needed.